Prashanti Nilayam suddenly seemed to be filling up with former students of the Sri Sathya Sai University on the last day of 2008. The alumni of Bhagavan Baba’s schools and colleges have decided to make a beginning at His lotus feet on the first day of the New Year, every year, and hence they congregate in increasing numbers each passing year on Dec 31-Jan1. 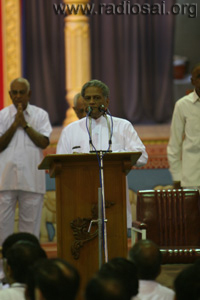 Around 500 former students had assembled in the Divine presence of Bhagawan this time around to bid adieu to December 31, 2008 and welcome 2009. And what’s more heartening is that Swami too looks forward to His children's homecoming as He ensures that all arrangements are in place for their comfortable stay. But this time, He had decided to bestow a greater boon upon them as He had sent word that He would interact with all of them in the Poornachandra Auditorium after the morning bhajans. By 8:30 a.m., all the students had assembled in the auditorium. At about 9:00 a.m. Swami arrived for darshan. The time scheduled for the interaction with the alumni was only 10:00 a.m. But, while Swami took a complete round of the Sai Kulwant Hall, He seemed to be in a great hurry. Yes, no prizes for guessing why! His beloved children awaited Him in the auditorium and He seemed too eager to get there as soon as possible! 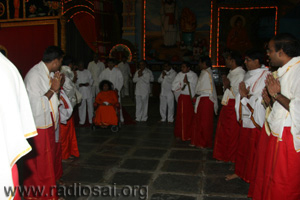 Twenty minutes later, at 9:20 a.m. Swami received aarthi and moved into the Poornachandra auditorium. 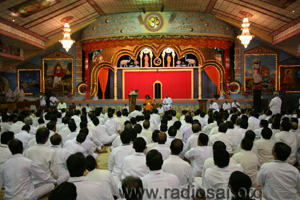 A small stage had been arranged for Swami so that He could be seen by one and all assembled. 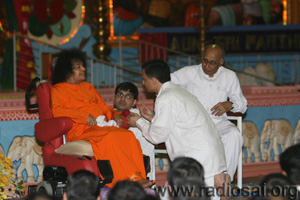 Swami was welcomed by a small contingent of ‘Veda chanting boys’ and soon He took His place on the stage, and also in the thirsting eyes of every alumnus sitting there. 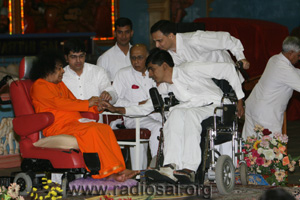 There were also many elders whom Swami brought along with Him – Mr. Chakravarthy, Secretary of the Sri Sathya Sai Central Trust; Prof. Vishwanath Pandit, the current Vice Chancellor; Mr. V. Srinivasan, the All India President of the Sri Sathya Sai Seva Organisation; Prof. G. Venkataraman, eminent scientist and former Vice Chancellor of Sri Sathya Sai University and currently the Director of the Radio Sai studios; and Mr. S. V. Giri, IAS and another former Vice Chancellor of His University. Mr. Chakravarthy introduced the speakers for the day. First, Mr. S. V. Giri spoke on the responsibilities that rest on the strong shouldersof the alumni. As he spoke, an interesting incident took place. One of the members of the alumni, a senior, maybe above 50 years of age, kept moving to and fro right at the back, possibly to get a good view of the proceedings. Swami noticed that and seemed a bit uncomfortable. And sure enough, in less than two minutes, the student next to Swami came walking all the way to the back asking, "Who was walking over here?" At first everyone felt that Swami was disturbed. But soon it came to light that Swami was disturbed not because somebody was distracting Him but because He was concerned about that student’s problem. The student whom Swami had sent managed to locate this alumnus and asked, "Sir, would you like a chair to sit on? 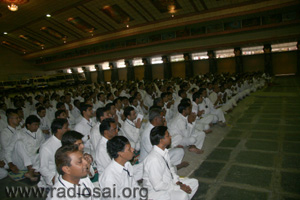 Swami sees that you are not able to sit on the floor." That senior alumnus answered with a nod saying, "No" and tears started streaming down his cheeks. He then got up and moved towards the front, and finally sat in the corner but in the first row! Swami saw that and seemed very satisfied! The second speaker was Mr. V. Srinivasan. 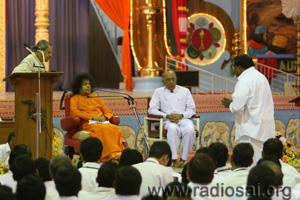 He spoke very inspiringly on the growth and spread of the Sri Sathya Sai Seva Organisations in India. Many facts little known to most of the devotees and students were revealed and the students applauded many times during his speech. 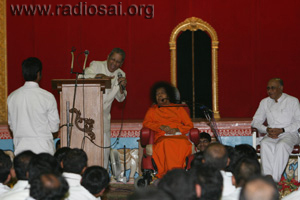 After his presentation, Swami told him to announce with great pride that he was the All India President of Sai Organisations. An overwhelmed Srinivasan concluded his speech expressing that more than anything else he just wished to be a humble devotee. The alumni coordinator then went forward to request Swami for the divine discourse. Swami materialized vibhuti and gave it to him, and also agreed to address the students. Now, another poignant scene took place. 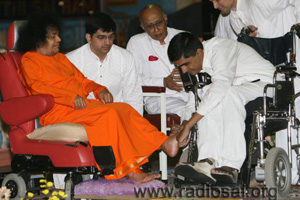 Swami noticed a student, Raghuram, who currently works in Radio Sai Global Harmony. For the past 4-5 years, he has been confined to a wheel chair because of a tragic accident. 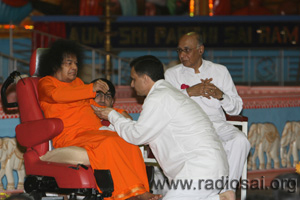 Swami asked him to come over to the dais. As the boy reached there, Swami waved His hand and materialized a gold ring. Amidst the cheer that ran about the hall, Swami enquired into the well being of the boy's mother and sister. Swami also promised him that he would very soon speak to them as a family and then put the ring onto his right hand. The boy then asked Swami for padanamaskar. Swami agreed and knowing that it was very difficult for the boy to bend down, Swami did something that no one could ever have imagined. He slowly lifted His right leg and placed it near the knee of the boy. 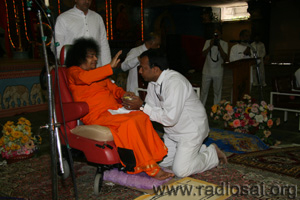 After he touched it, Swami now raised His left leg too and placed it there! The boy was thrilled at this special padanamaskar. As he returned to His place, Swami began His divine discourse. Question 1 – Swami, we know that we are truth and that truth is everywhere. So we must be everywhere right?…..
Swami seemed unable to follow the question, and hence the boy tried to explain (!) "Swami, I'm everywhere but I don't realize it…!" Question 2: Swami, we don't have time available for spiritual activities and service as we are bogged by daily responsibilities. What shall we do (there were tears in his eyes out of helplessness)? Swami: Don't feel bad about it; do as much as you can in the little time available. Do little service but offer it to the Lord. If you can't do even that, then just do your job or activity as a service to the Lord; that'll make Him happy. Question 3: (In Kannada) Swami as we (boys) plan to do activities and projects in larger scale, how do we go about doing the same. Do we need to form organized groups and start off? Swami: (In Kannada) Yes, form proper groups and go about it in a systematic way. I've already told this (Swami has mentioned the same in His discourses to management students). Question 4: (one student who was a Teacher) Swami, we all have only one prayer in our hearts, you should walk like you used to earlier. Swami: (without a pause) Yes, I will! I used to walk earlier properly, only recently I had a fall and doctors told me not to walk and take rest. I'm just abiding by their words. I have organized a Yagnam in Puttaparthi (the Athi Rudra Yagnam) and one in Chennai (The Athi Rudra Yagnam in Jan 2007). I'm managing quite a lot like this too, but I'll surely walk (Swami lifted both His legs and played them in the air as He spoke). Question 5: Swami, what should we do to become closer to Swami? Swami: (without any delay) Swami should (will) take you closer! (Swami conveyed it is His grace that matters not any amount of penance one does and added that…) If you want to become closer, keep Swami in your heart. Then you need not come to Swami and He will come closer to you. Question 6: Swami, how do we get Atmanandam (perennial bliss)? Swami: You should carry less luggage. Less luggage is more comfort, reduce your desires and put a ceiling on it. Question 7: Swami, how do we take care of our kids in countries where there are not even Indian families, let alone Sai centers? Swami: Where are you right now? Boy: I've returned to India …. Swami: I'm very happy. Congratulations! (He became emotional…) America is not good at the moment, all our people should return to native land. One lakh in USA is equal to 10,000 in India. Question 8: Swami, how do we achieve total surrender? Swami: Bangaru! Surrender is not so easy; so many after they surrender would still carry the burden of doubt in their minds. So just follow how much you can and stop doubting. It was already nearing 11:30 a.m. and Swami said that He would speak to all the next day too. Then Swami received aarthi and blessed those who took a flower and the holy grains up to Him. 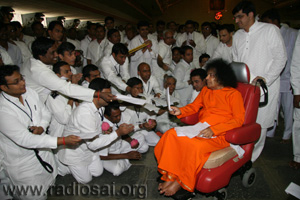 As He moved back towards His residence, Swami collected letters from all the students who lined up the entire pathway. He retired leaving behind cherished memories and wonderful feelings.